Lynn Mueller is the CEO of International Wastewater Systems, which has $80 million worth of projects in the works. Clean energy can be a dirty job. That's particularly true if you're Lynn Mueller, the founder of International Wastewater Systems, who has built a $20 million business harvesting heat from sewage. The Sharc is designed for use in major developments like apartment complexes or neighborhoods. Mueller has completed 12 projects so far -- including for several residential developments in Vancouver, a university in Scotland, a wool testing authority in Australia, and the county wastewater facility in Camden, New Jersey. Word is spreading -- and Mueller says his phone is ringing off the hook. "We quickly went from being a local, small company to a worldwide operation. We've seen markets around the world demanding the product," Mueller said, adding that his company has an additional $80 million worth of projects in the works. Mueller launched International Wastewater Systems about six years ago. It's headquartered in Vancouver, Canada. Here's how it works: The sewage -- which is already at about 70˚F, thanks to showers, dishwashers and washing machines -- passes through a heat exchanger, which transfers the heat energy from the contaminated water to clean water. It then feeds a heat pump, which is key to what makes the Sharc a wise investment: "It only takes $1 worth of electricity to provide $4.50 worth of heat energy," Mueller said. The Sharc can replace space heating costs and hot water heaters, both of which eat up a big part of a gas or electric bill. It can also completely replace the cost of using gas or electric heat in buildings that use "hydronic" water loop systems -- which most large-scale developments do. It's not a new technology. Heat pumps have been used by factories and other industrial plants for decades, and they're often used in car engines and refrigerators. 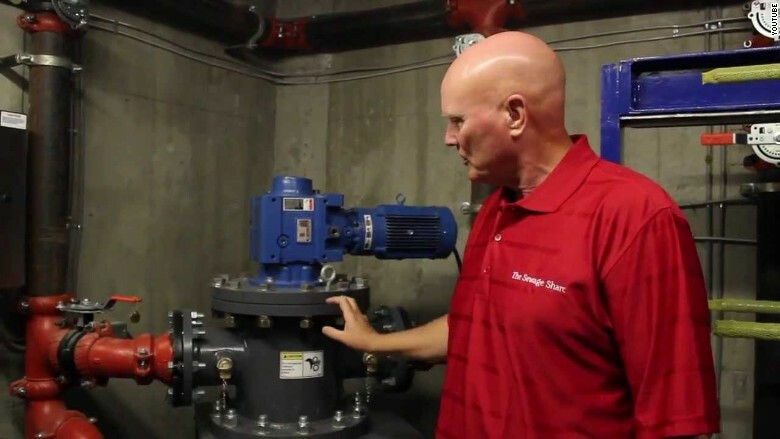 But sewage heat reclamation is uncommon, and Mueller's company is one of the first to offer a one-stop shop for building, installing and maintaining the technology. 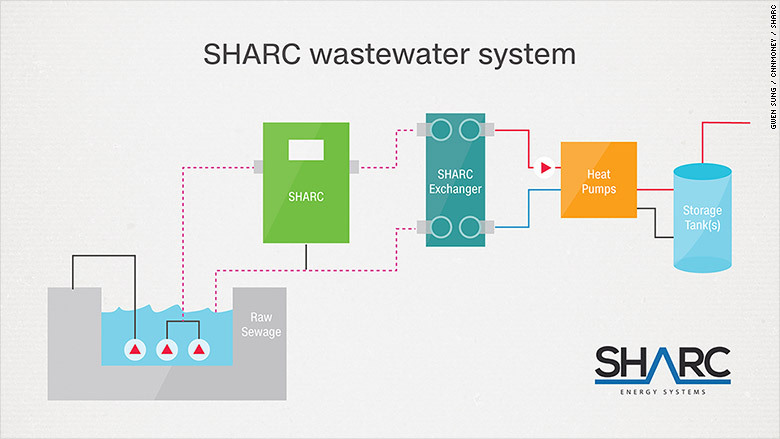 The Sharc system transfers the heat from sewage to provide heating, cooling and hot water. The Sharc systems aren't cheap. 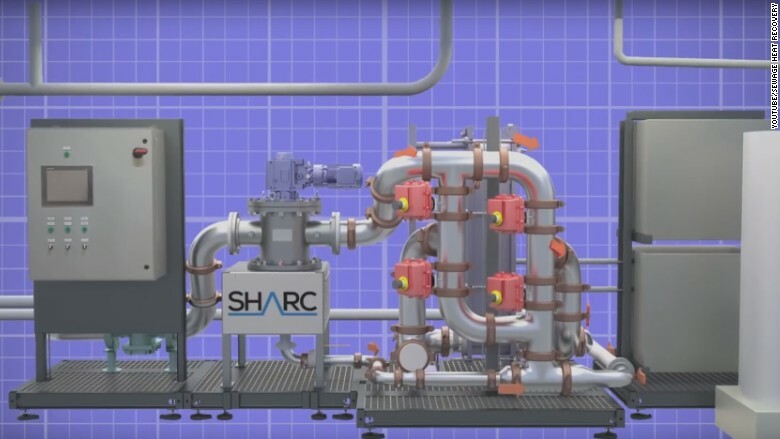 A Sharc can cost anywhere from $60,000 to more than $1 million, depending on the project, and the annual maintenance fees run between $3,000 and $4,000. Adera Developments installed a Sharc in a townhouse and a condo development in Vancouver three years ago. President Norm Couttie said it recovers about 70% of the heat from wastewater and that the systems will pay for themselves in 10 years. Plus: "The system is completely sealed. It doesn't smell," he said. Some of International Wastewater System's clients have used grants to cover a significant chunk of the upfront costs. For the $1.1 million Sharc installed at Camden County Municipal Utilities Authority in New Jersey, for example, all but $100,000 was covered by a clean energy grant. Andy Kricun, the executive director of the Camden County Municipal Utilities Authority, said they'll make the $100,000 back in two years. The Sharc has a lifespan of 25 to 40 years, which means the savings could ultimately be as much as $2 million. "If [the Sharc] can be marketed in a cost-effective way," Kricun says. "It can be a transformative thing."